Dr. El-Gabalawy is an Assistant Professor in the Departments of Clinical Health Psychology and Anesthesiology, Perioperative and Pain Medicine in the Max Rady College of Medicine at the University of Manitoba. She also holds adjunct appointments in the Departments of Psychiatry and Psychology (Fort Garry Campus). As a Vanier Scholar, she received her PhD in Clinical Psychology from the University of Manitoba in 2015 under the co-supervision of Drs. Corey Mackenzie (Psychology) and Jitender Sareen (Psychiatry). She also completed a predoctoral research fellowship supported by a CIHR Michael Smith Foreign Study Supplement at Yale University under the supervision of Dr. Robert Pietrzak. Before joining the faculty at the University of Manitoba, Dr. El-Gabalawy completed her Clinical Psychology residency at the Medical University of South Carolina (Charleston Consortium) with a behavioural medicine and civilian trauma emphasis. Dr. El-Gabalawy is also a co-investigator and the Clinical Research Network Director of the Chronic Pain SPOR Network at the University of Manitoba. 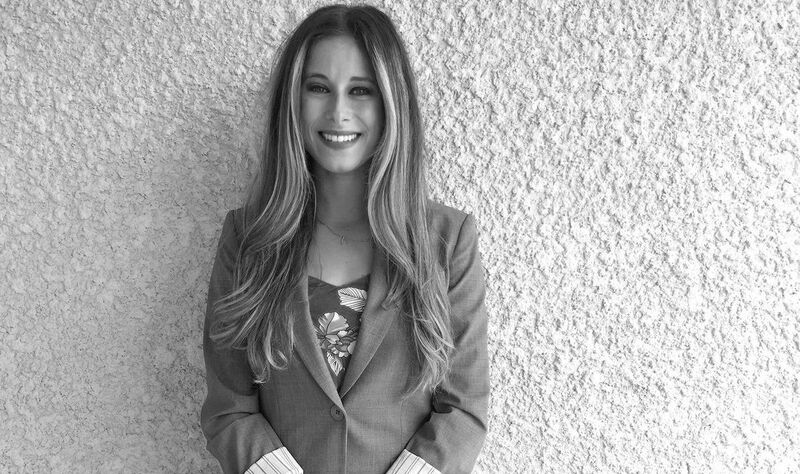 Caitlin is a third year PhD student in Clinical Psychology working under the supervision of Dr. El-Gabalawy. Her primary research interests are understanding the complex relationship between mental health and inflammatory conditions, and behavioural interventions aimed at improving mental and physical health. Her dissertation focuses on the impact of anxiety disorders and post-traumatic stress disorder on indicators of disease severity in rheumatoid arthritis patients. She is also examining the impact of an online cognitive behavioural intervention on mental and physical health outcomes in rheumatoid arthritis patients. Caitlin has received doctoral funding from the University of Manitoba and the Arthritis Society. She is also the Prairie Regional Director for the Canadian Arthritis Trainee Association. Click here for her bio. Jordana is a second year MA student in the Clinical Psychology program and is co-supervised by Dr. El-Gabalawy and Dr. Kristin Reynolds. Her MA thesis examines the relationship between perioperative dissociation, delirium and post-traumatic stress disorder using a mixed-method approach. Her MA research is funded by the Canadian Institutes of Health Research and the University of Manitoba. She has also received a scholarship from the Centre on Aging at the University of Manitoba. 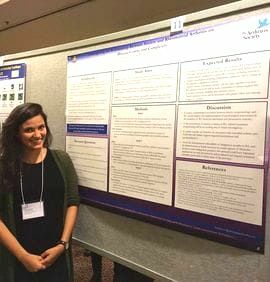 Jordana previously completed her undergraduate thesis under the supervision of Dr. El-Gabalawy and was awarded the Ten Have Award for the most outstanding undergraduate Psychology thesis and the Canadian Psychological Association Certificate for Academic Excellence. She is also involved in several other studies focused primarily on post-traumatic stress disorder and health including perioperative medicine. 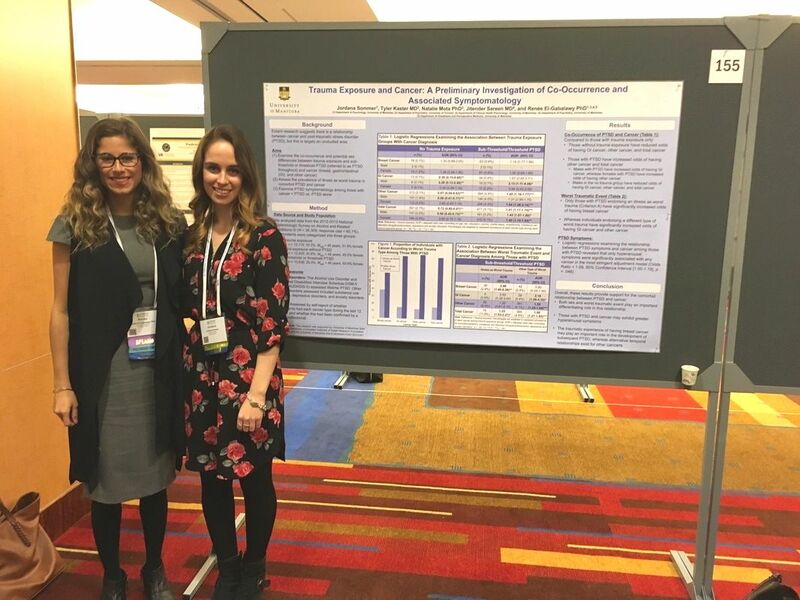 Elena presenting her work at the 2018 ADAA conference in Washington D.C.
Elena is a research assistant in the HATLab and is a second year MA student in the Clinical Psychology program co-supervised by Dr. Matthew Keough and Dr. Edward Johnson. She previously completed her Master’s of Science in Physiology and Pathophysiology at the University of Manitoba under the supervision of Dr. Jennifer Kornelsen, a collaborator of Dr. El-Gabalawy's. In the HATLab, Elena is involved in projects relating to anxiety and trauma-related disorders and comorbid chronic pain, and the impact of comorbidity on substance misuse. She is also the research coordinator for a funded randomized controlled trial examining the impact of mindfulness-based stress reduction on total knee arthroplasty outcomes (co-PI's: El-Gabalawy & Kornelsen). Matthew is a research assistant in the HATLab and a third year PhD student in Clinical Psychology at the University of Manitoba. His research interests include health psychology and knowledge translation. He is primarily involved in research examining the relationship between anxiety and indicators of disease severity among inflammatory arthritis patients. Kayla is the research coordinator for an HSC Foundation funded grant (co-PI's: El-Gabalawy & Sabourin) aimed at developing a multidisciplinary online intervention for chronic pain. She previously was the research coordinator for the SPOR Chronic Pain Network at the University of Manitoba and continues to be involved in chronic pain research. She is currently a first year MA student in the School Psychology program at the University of Manitoba. Rachel is the research coordinator for the SPOR Chronic Pain Network at the University of Manitoba working under the supervision of Dr. El-Gabalawy. She is also the acting lab manager for the HATLab. She completed her Honours Psychology degree at the University of Manitoba under the supervision of Dr. Toby Martin in the area of Applied Behavioural Analysis. She is currently involved in several chronic pain research projects examining the efficacy of a variety of treatments for chronic pain as well as clinical database development upon which future research will be conducted. Desiree is a volunteer research assistant in the HATLab. She previously completed her Honours Psychology degree at the University of Manitoba. She is involved in a number of studies including perioperative qualitative investigations in order to better understand patient's experiences with surgery. She is particularly interested in interventional research. Dr. Ling is a resident in Anesthesiology, Perioperative and Pain Medicine (PGY2) at the University of Manitoba and is completing her research rotation under the supervision of Dr. El-Gabalawy. Her project is focused on the impact of shared chronic pain experiences between loved ones on healthcare utilization and chronic pain severity and complexity.